This sofa table is an excellent addition to your home. It includes traditional features such as slightly curved top edges, a metal bail handle, tall block legs, and a simple apron. Store TV remotes, games, or magazines in the drawer and place a decorative item on top. Made with solid wood and completed with an oak finish, this table is warm and charming. The 1400 Single Drawer Sofa Console Table with Metal Bail Hardware and Tall Legs by Null Furniture at SuperStore in the Williston, Burlington, VT area. Product availability may vary. Contact us for the most current availability on this product. Accent your living room with the 1400 Table Group. These pieces include gorgeous traditional details such as metal bail hardware, tall block legs, and simple aprons. Each item includes a drawer that allows you to stow away any small items, such as TV remotes or magazines. Made with solid wood and a warm oak finish, this collection provides you with inviting occasional tables that will last for years to come. 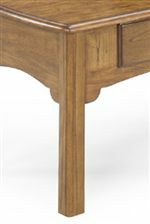 The 1400 collection is a great option if you are looking for Traditional furniture in the Williston, Burlington, VT area. Browse other items in the 1400 collection from SuperStore in the Williston, Burlington, VT area.